Unfortunately the combination of being back at work, and working nights, and a market that just continues its slow march higher has really put a damper on my options activity. This past week only saw 5 positions either being opened or closed which is a marked decline from the double digit weekly moves I was making throughout most of January. I hope to get back to putting on some more trades,but only when the set up looks right. Even if I can't and have to swap to a more measured approach to building out my portfolio I can't really complain with over $3.2k in profit from options over the last 6 months. Disney was announcing earnings this past week and since my recent analysis showed that it's trading around fair value I figured that now was as good a time as any to do my first option trade in the company. The options premiums were a bit juiced with earnings on deck so I decided to make a shorter term play with a put option expiring on Friday of last week. I also closed this contract last week for a nice gain. The net profit on this contract worked out to $85.91. Based on the $10,800 of capital "at risk" that's a 0.80% return. However, if you check the dates on that it was earned in only 4 days making it an annualized return of 162.4%. I was able to capture 94% of the max profit in just 75% of the days to expiration. Ideally I would have locked in all of the profits on this trade, but there were a few things working against me. For starters, since I'm back at work and working nights it makes it difficult to be active and look for opportunities in the options market. A guy's got to sleep, right? The other reason was that the share price was fairly close to the strike price of the contract. While it wouldn't be a bad thing to own shares of Disney around $107 I felt I could get a better cost basis by closing this contract and establishing a new position. 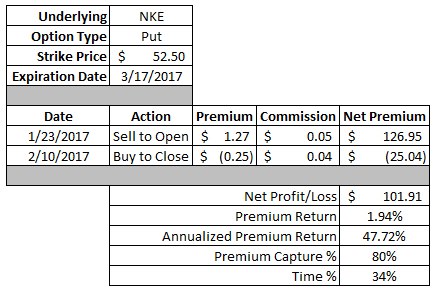 Nike had been one of my favorite companies to sell put options against. The share price was just slightly above the high end of my fair value range which set it up nicely for selling puts and collecting premiums. Nike's share price had rocketed higher over the past week and ended the week over $56. Since the strike price on the put contract was $52.50 that meant the option got cheap so I went ahead and bought it back to close the position. This contract generated a net profit of $101.91. That's a 1.94% return based on the $5,250 of capital used to secure the put. On an annualized basis that's a solid 47.7% return. I was able to capture 80% of the maximum profit in just 34% of the days to expiration. Over the last several months I've opened and closed 5 different put contracts on Nike and collected over $300 in total premium. So despite the current share price being up over $56 I could effectively buy it today at a $3 discount. If we get a slight pullback in Nike's share price then I'll be looking to open another contract in Nike. If you're comfortable doubling down on company I think the covered strangle is a great choice. The covered strangle is when you own 100 shares of a company, sell an OTM call option and an OTM put option. It's a way to double up on the premium you receive since you're selling 2 contracts. Ideally the share price would stay between the two strike prices and you'd just keep your shares and the total premium as profit. 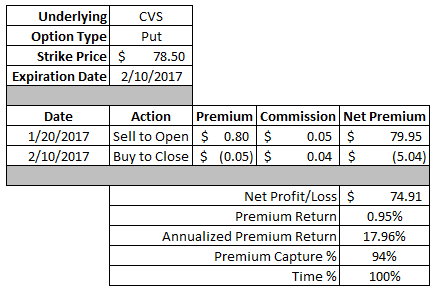 I originally opened the position in CVS with a buy-write covered call back in mid-January at a purchase price of $83.20 and collected a total premium of $69.95. The share price declined after opening my position which allowed me to sell a put option with a $78.50 strike just a few days later and collect an additional $79.95 in option premium. The total profit on this trade worked out to $69.95. Based on the $86 strike price that's a 0.81% return. The annualized return works out to about 13.7%. Not bad if I do say so myself. The put option worked out even better than the call. The net profit on this contract came to $74.91 which is a 0.95% return based on the $7,850 of capital used to secure the position. On an annualized basis that's a 18.0% return. I would have preferred to just let this contract go all the way through expiration; however, I put in a limit order to close it out since the contract was ITM as of Thursday's close. 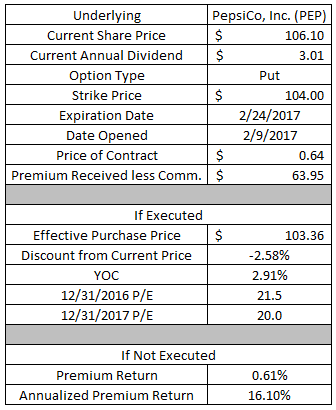 Much like the previously reported Disney put option I felt there would be better opportunities to generate option premium or purchase shares at a bigger discount so it made sense to close this contract. All told the covered strangle provided $144.96 in profit which effectively reduces my cost basis from $83.20 down to $81.75. I'll likely look for opportunities to at least sell another put option CVS and potentially another covered strangle should it present itself. Pepsi is a long time holding of mine, but it's a new entrant as an options play. Pepsi will be announcing earnings this week so the option premiums are a bit juiced compared to normal which opened up the opportunity to sell a put option. If Pepsi's share price falls below $104 then I'll have to buy 100 shares of the company for the strike price less the premium received. That will give me an effective purchase price of $103.36 per share which is about a 2.6% discount from the current share price. At that purchase price the valuation looks decent considering the stable and consistent nature of the business. The trailing P/E, based on 2016's earnings estimates, works out to 21.5x and the 2017 forward P/E based on analyst estimates would be 20.0x. Like I said, decent, but not exactly enticing. 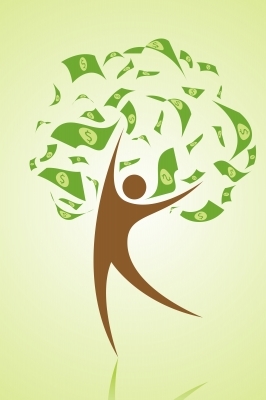 At the current quarterly dividend rate of $0.7525 the yield on cost would be a solid 2.91%. If Pepsi's share price remains above $104 then I'll get to keep the full option premium as profit. Since the put option requires $10,400 to secure the contract that's a 0.61% or 16.1% on an annualized basis. 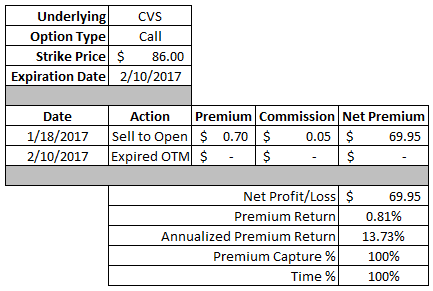 Thus far in February I've been able to generate $582.36 in profit via closed/expired options. Year to date I've collected $2,211.75 in option premium profit. I currently have 7 open put contracts in my Rollover IRA with total capital requirements of $57,100. I'd like to get a few more contracts put on this week, but time will be a big factor in that since I can't catch much of the market hours. As far as positions to monitor I have 7 positions across all my accounts that expire this coming Friday. My covered strangle in V.F. Corporation (VFC) might need some attention since the share price is currently hovering around the short put strike. My jade lizard in Visa (V) (MARR analysis here) will need some monitoring in order to maximize the profit. The put contract in Johnson & Johnson (JNJ) is likely fine to just let it go until expiration, but the United Parcel Service (UPS) put option will need to be rolled out in time. Nice annualized returns on solid companies. You can hardly lose! That's the real beauty of using options as a supplemental income source. The worst case scenario will all of the put contracts was that I would own shares in great dividend paying companies. That's not a bad place to be. 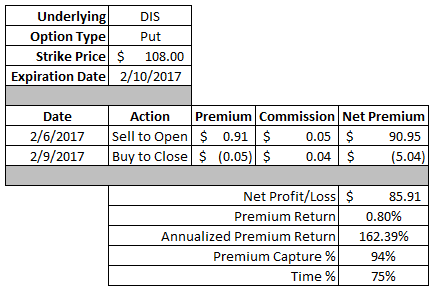 I'm really liking using options as a way to supplement my dividend income. It's something I want to keep playing with to see if it would be a possible way to help fill in the gap once we take care of some of our debts.